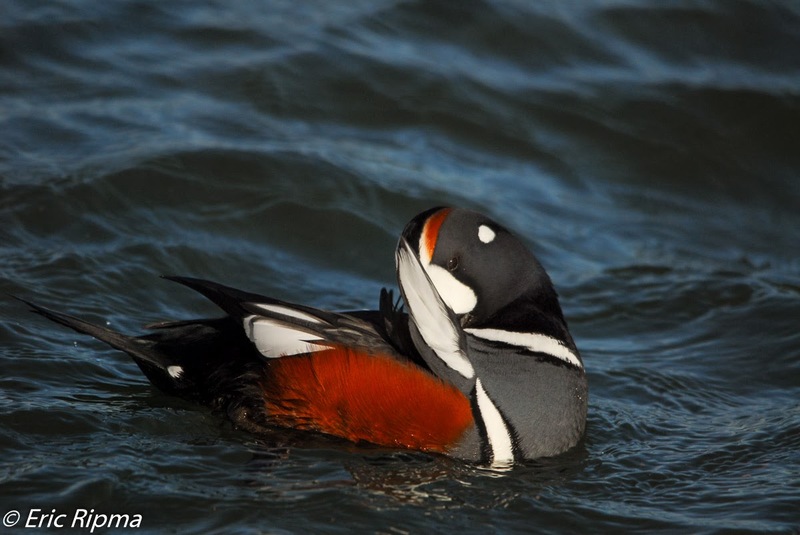 Why is Barnegat Lighthouse State Park known as such a great bird photography location? 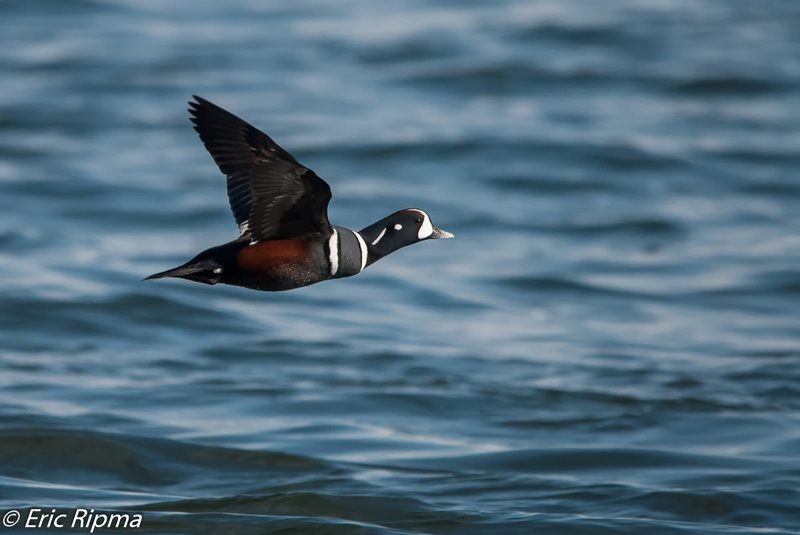 One of the major reasons are the extremely photogenic Harlequin Ducks. 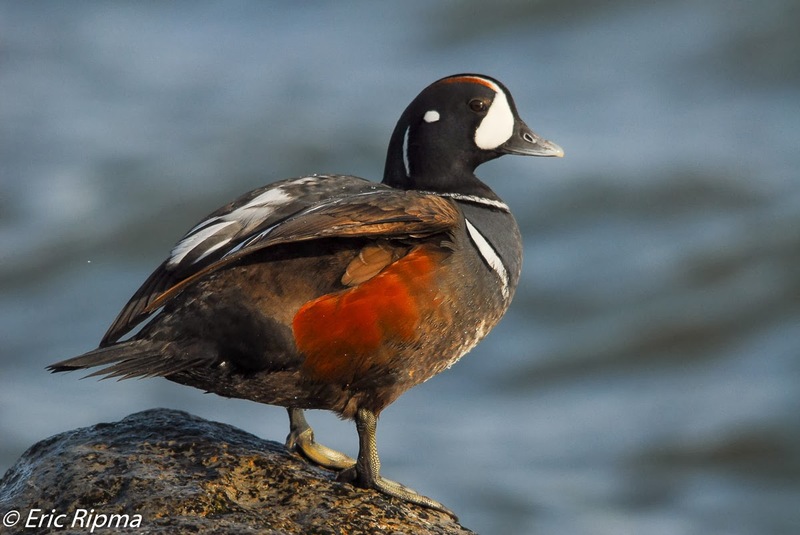 The stars of the show, the Harlequin Ducks, aren't alone; they are joined by Long-tailed Ducks, all three Scoters, Red-breasted Merganser, Common Loon, Purple Sandpiper, Great Cormorant, and much more. Most allow close approach and fantastic opportunities for any photographer. Capturing great images of Harlequins in the water takes some patience but is fairly easy. However, if you want some flight shots, much more time and effort are involved. Luckily, many birds fly up and down the inlet at Barnegat allowing for ample flight photography. If you can keep yourself from getting distracted by all the other birds, you will eventually have some opportunities as Harlequins fly by at close range. 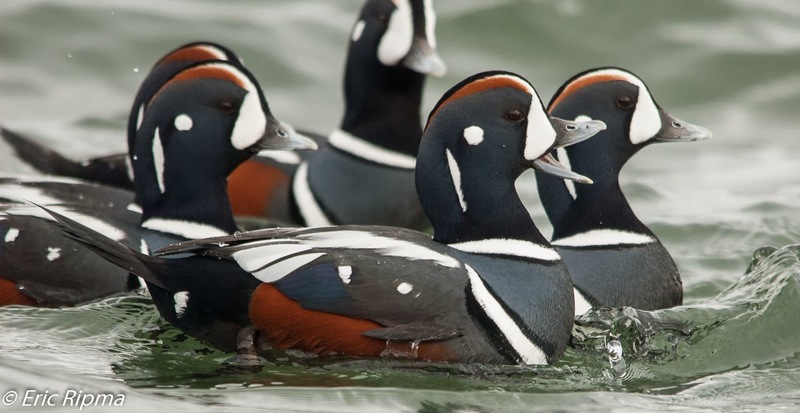 If you can peel your camera lenses away from the male Harlequins there are also females, usually within the flocks of males. 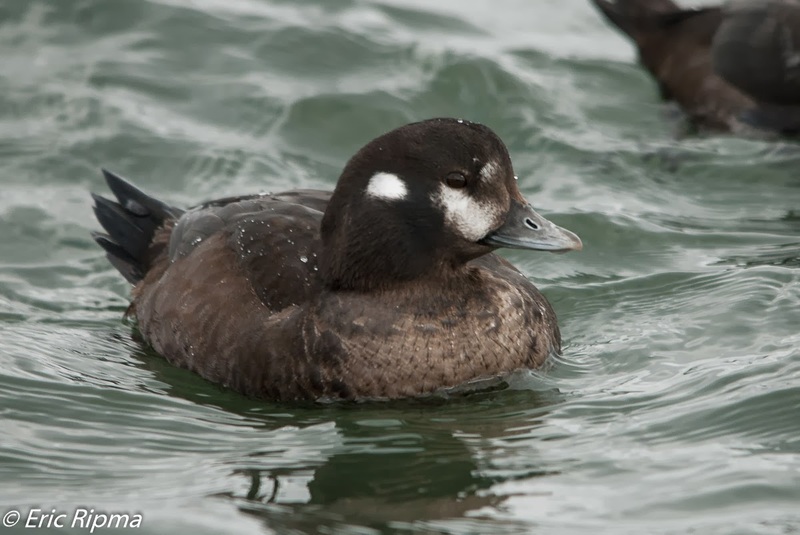 The females are much drabber and not quite as photogenic but they also have a "good" look if you give them a chance. One of my most wanted shots was a Harlequin perched on one of the rocks. Luckily, the Harlequins commonly hop up onto the ocean-side rocks. There are some difficulties with getting this shot. Usually when there is one Harlequin on a rock, there are 6-8 other Harlequins perched all around. So, trying to isolate just one becomes a chore. The Harlequins also tend to be a little more uncomfortable with close approach when on the rocks. This Harlequin was about to get back into the water. As you can see, the rest of his flock was in the water behind him. During the winter, while the Harlequins are at this location, the morning light is great for photographing the Harlequins. In the afternoon it is great as well, but also better for shooting straight out from the breakwall, for all the other waterfowl. If you have never been to Barnegat and you are a photographer, it should definitely be on the top of your list of places to go. 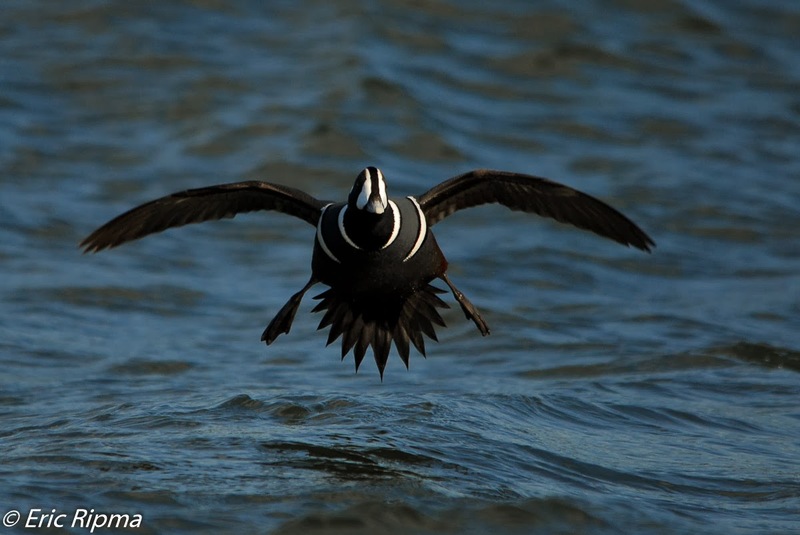 We, Sabrewing Nature Tours, will have a waterfowl photography tour along the east coast next winter (2015) that includes Barnegat. 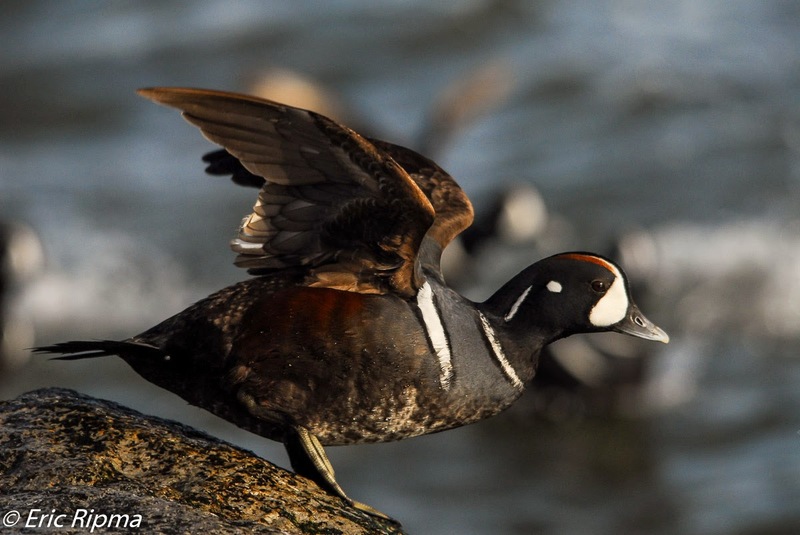 It will be as good of a time as ever to capture some amazing waterfowl photographs!